A low-priced, temperature free-diving wetsuit. When my Beuchat Men’s Crawl C500 started to die, I looked to getting a new “temperate” wetsuit. By temperate I mean water temperatures from 24 or so degrees upward. Below that, I usually go for my Beuchat Espadon Equipe. One of my criteria was that the suit not be open-cell (contrasted to, e.g., the Espadon). Why? I’d like to just pull it on and go, and open-cell suits tend to require more hand-holding to get on and off. They’re also more fragile. I really enjoyed the simplicity and durability of the C500—in particular when we were constantly getting into and out of the water. I also really wanted a hood, which seems to buy me a few degrees of temperature resistance. The two-piece 3 mm Scubapro Element appeared as a cost-efficient solution. 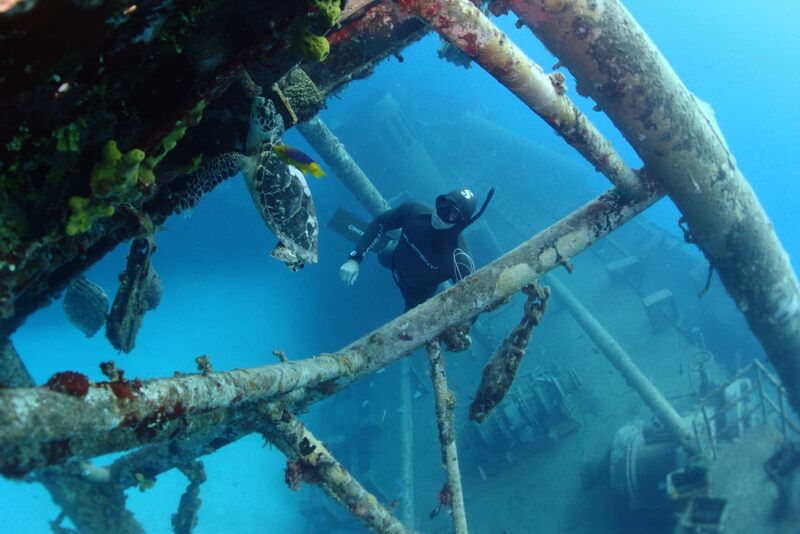 Turtle spotting over the Ex-USS Kittiwake. One of my reasons for not wanting an open-cell is durability, but within a few dives, the suit has already begun to tear. I frankly don’t think the suit has more than a few dozen dives in her—but we’ll see. (Maybe this is just growing pains?) I’d be more forgiving were the suit to have some sort of super-smooth neoprene, but it’s not. The second is that it’s extremely difficult to pull on and off. Granted, I have slightly wider shoulders than usual, but pulling it on dry still requires some serious contortion. Pulling it off is worse: the wet neoprene sticks to everything, and I worry I’m going to rip the whole thing in two every time. Sitting on the Ex-USS Kittiwake. Most of all, it’s just not a great fit for me. It seems to be designed for a slightly more… “robust” body type. That wouldn’t be so bad, but it means it flaps around the waist and water seeps upward through the hips. Right, this reminds me—the top beaver-tail connects with velcro. Needless to say, the inside of the suit is already pockmarked. Buttons are really the way to go, here. Any positive notes? The temperature is alright, though I’m not really a good measure here—I get cold easily. Diving in 24 degree water (20 or so below the thermocline), I get quite cold within an hour or two. Despite only doing a dozen or so dives with the Scubapro, I’m already looking for another solution. Given the difficulty of pulling it on and off, I might as well go for a thinner open cell. Or what looks more likely—a one-piece back-zip with a hooded bib.